The accompanying page is from Taiwan Wu-Lin Magazine nearly 20 years ago. During that time I was in Beijing and one of the staff at Wu-Lin had asked me if I could send information that showed applications regarding drawings shown in a 1936 book mentioned below. I sent him the materials needed and the next year I saw the results published. I would like to share several of these pages with you this week, with full credit given to Wu-Lin Magazine. A young scholar of martial practices named Yan De-Hua had the opportunity to study Baguazhang with Zhou Yu-Xiang, one of Cheng Ting-Hua’s most distinguished students known for his expertise in striking and throwing. 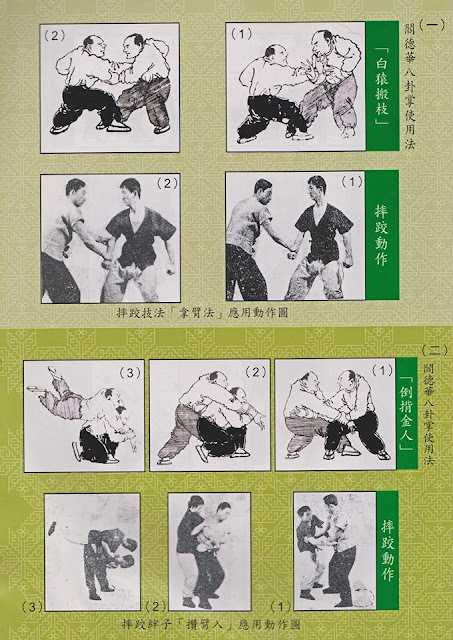 As Cheng was adept in throws, it was quite natural to see old publications over the years from Cheng’s students that focused a good amount on Chinese throwing methods that Cheng had studied in northern China near 保定 Bǎodìng, Heibei, a region famed for unparalleled 摔跤 Shuāi-Jiāo (Fall-Tumble [Thrown Down and Tumble]), known there by its colloquial name 快跤 Kuài-Jiāo (Fast Tumbling [Fast Throwing]). After years of practice Yan De-Hua had decided to author a book that would clearly show and preserve for future generations the Bagua methods that he had learned from Master Zhou. After three years of writing and drawing he published his book in 1936 with the title ‘Wall-Breaking Shaolin.’ I knew several old Bagua teachers, including Madam Sun Jian-Yun (Sun Lu-T’ang’s daughter), who had known Yan and explained why he used ‘Wall-Breaking Shaolin’ as the title instead of one with Baguazhang in it. Yan had explained that Baguazhang was a relatively unknown martial art to most of China, but Shaolin Boxing was familiar to most. In 1936 China was under aggressive military campaigns by Japan. News and daily pamphlets were being spread by the Japanese military telling that the Chinese people were weak both mentally and physically and needed proper leadership by Japan. Yan, one of many boxing masters, decided to strengthen China’s spirit by writing boxing manuals that not only taught methods of self-defense but also provided inspirational stories about the skills of Chinese boxing masters. Yan had explained that Baguazhang was a relatively unknown martial art to most of China, but Shaolin Temple Boxing was familiar to most as an art with mysterious powers that Chinese monks shared with the rest of China. In such, Yan decided to attach the name Shaolin along with the Chinese boxing term ‘Wall-Breaking’ which refers to fighting methods so powerful that each could break through a stone wall. Part 2: Continuation of this article coming next. More pairings of 八卦掌 Bāguàzhǎng and 摔跤 Shuāi-Jiāo applications along with the changes of the book’s title made by Yan De-Hua over the years. Special Note: Many of you have asked if I was planning to publish Yan De-Hua’s book in the near future? Yes, I am. I realize that many people have already translated Yan’s book, but I working on a thorough translation that explains the hidden, often unknown aspects of each of Yan’s techniques as passed down by several of Yan’s disciples. I should have this book available around April of 2019. Please let me know if you are interested as this may help to motivate late night writing."